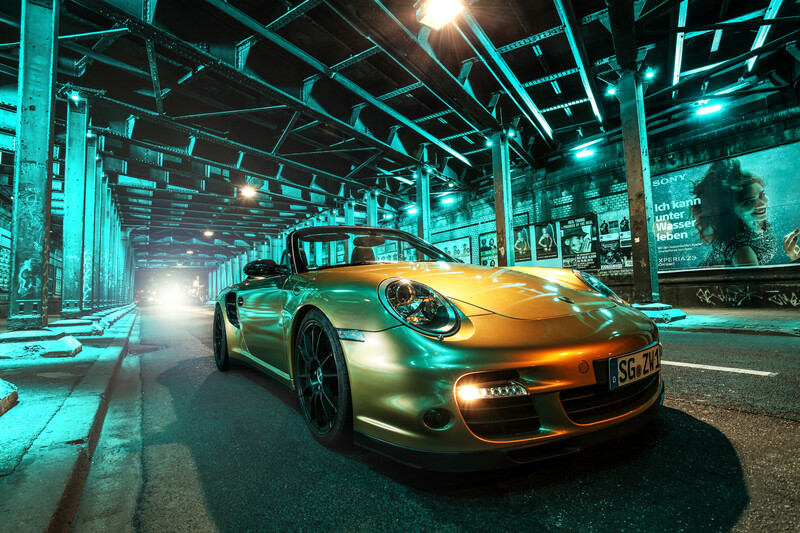 The WIMMER Rennsporttechnik Company at Solingen, Germany, is well known since more than 20 years not only for chip tuning. Also engine tuning activities for power uprating are planned and put into practice. Furthermore, the company in Bergisch Land manufactures individually custom and stainless steel made sports exhaust systems with sports catalysts and electronic valve command and road approval. Beyond that, this tuning company is competent partner for the whole automobile scope in questions of power uprating. 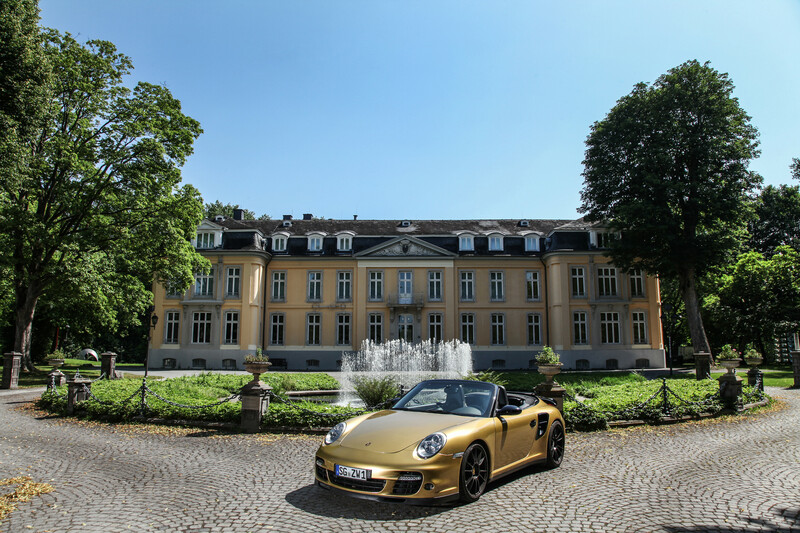 This time, the very creative team around Thorsten WIMMER has chosen a Porsche 997 Turbo in cabriolet version with serial 480 HP (= 353 kW) and 620 Nm of torque, coming from a six cylinders flat engine with 3.6 liters of capacity. Besides optimization of the engine electronics, the engine has been equipped with biturbo. For these aims, there have been installed two turbo chargers, spark plugs with higher value, reinforced pressure tubes and more powerful fuel pump. The mounting of a sports clutch was likewise the right decision in order to face the new challenges. It is a real sound happening that comes from the stainless steel racing sports exhaust system with electronic valve command and sports catalysts. Precision is top priority also in this case. The result of engine command unit data adjustment as well as the materialized modifications in sum are boisterous 840 HP (= 618 kW) of power with 870 Nm of max. torque made by WIMMER Rennsporttechnik promising pure riding fun! Correspondingly outstanding the reached values: The original 363 kmph (225 mph) of Vmax are now easy 348 kmph (216 mph), acceleration from zero up to 200 kmph (120 mph) going now within fantastic 10.1 seconds. "Matching" to the black O.Z.-Ultraleggera rims in 19 inches with Michelin tires in 235/35-19 and 305/30-19, the bolide was given a golden full wrapping. Wheel spacers of 25 mm each on the rear axle are perfectly topping the look of the car, in combination with KW variant 3 coilovers forming the optimal link between asphalt and this Premium-Class-Car. 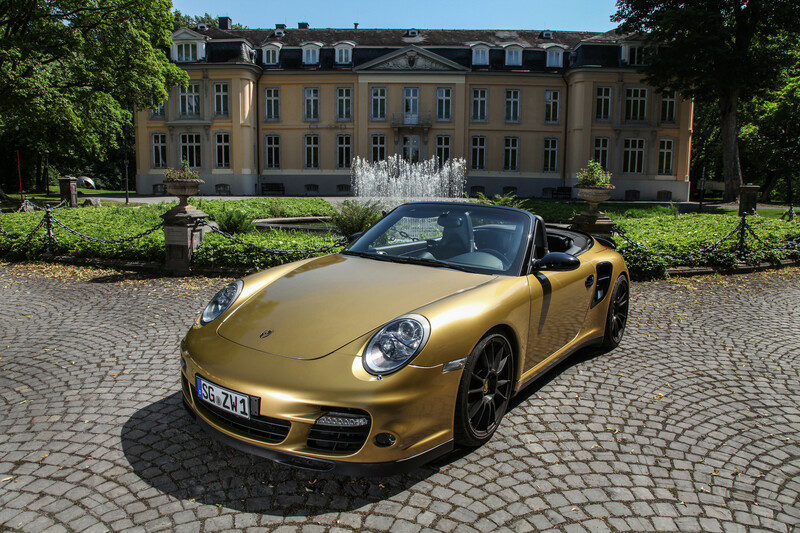 The technical optimization of this Porsche 997 Turbo Cabrio demands 39,000 €, rims, tires and chassis adding another 7,500 €.